Binance, the largest exchange by traded volume, launched its second fiat-to-crypto exchange yesterday. The first launched in the African nation of Uganda last October and supported Ugandan shillings. 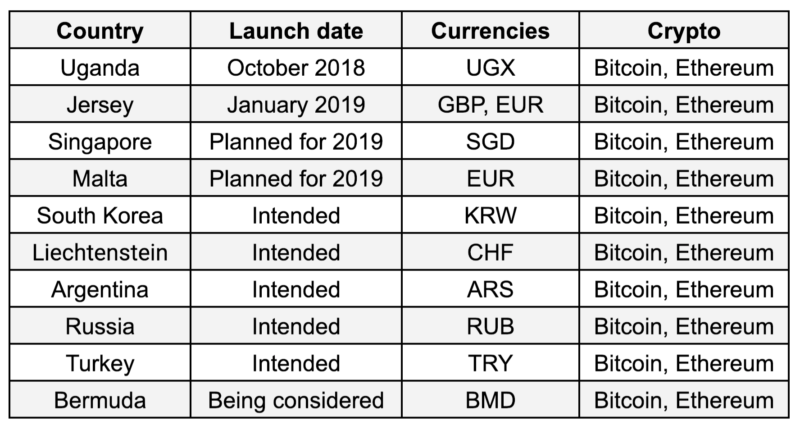 But these launches are merely the start of the company's stated plan to have two fiat-to-crypto exchanges on every continent. The exchanges are built on Binance's technology but formed as a separate legal entity. In order to minimize the regulatory friction, all the fiat exchanges are initially expected to only support two cryptocurrencies - Bitcoin and Ethereum. This year, Binance plans to launch at least two more; one in Malta and one in Singapore. The Block has learned from sources that the next likely launch locations are South Korea, Lichtenstein, Argentina, Russia and Turkey. According to a source familiar with the matter, Binance is also considering Bermuda as a potential home for a fiat-to-crypto exchange.